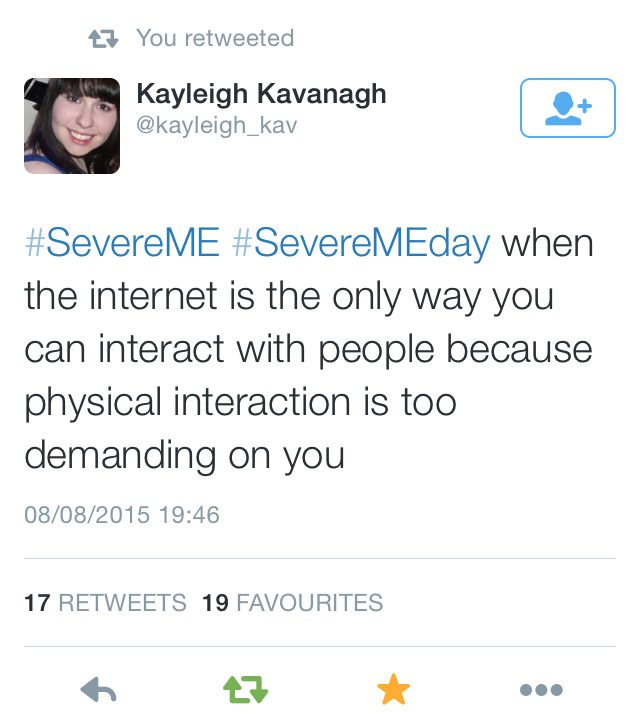 Yesterday was “Severe ME Awareness Day”. Quite ironically, I was too ill to post, so I’m doing it today instead. 25% of people with ME have it severely. Doctors would class my ME as severe, because I can’t leave the house, and spend the large majority of my day in bed. However I consider myself very lucky that I’m not bed bound, paralysed, in unbearable pain, and need to be fed through a tube. That is the reality for many people with this illness. They live in darkened, silent rooms, because they cannot bear the light or noise. Imagine that…living a dark and silent existence…I can’t imagine it, and I’m sure most of you reading this can’t either. Another reality is that this disease can be fatal. Part of severe M.E. awareness day is remembering those who have passed away as a result of this illness. A recent study in Denmark (link HERE if anyone wants to read about it) found people with M.E. have a lower quality of life than people with cancer, MS, schizophrenia, rheumatoid arthritis, diabetes, and people who suffered a stroke. To quote directly from the article “schizophrenia is one of the last diseases I would wish on anyone, but people with schizophrenia scored 21% higher in their QOL (quality of life) scores than people with ME/CFS”. When you take that into account, the fact that ME receives the same amount of funding for medical research as hay fever (yes! You read that right!) really is beyond belief. I’m going to stop there, because I can feel myself getting worked up, and I don’t have the energy for that. 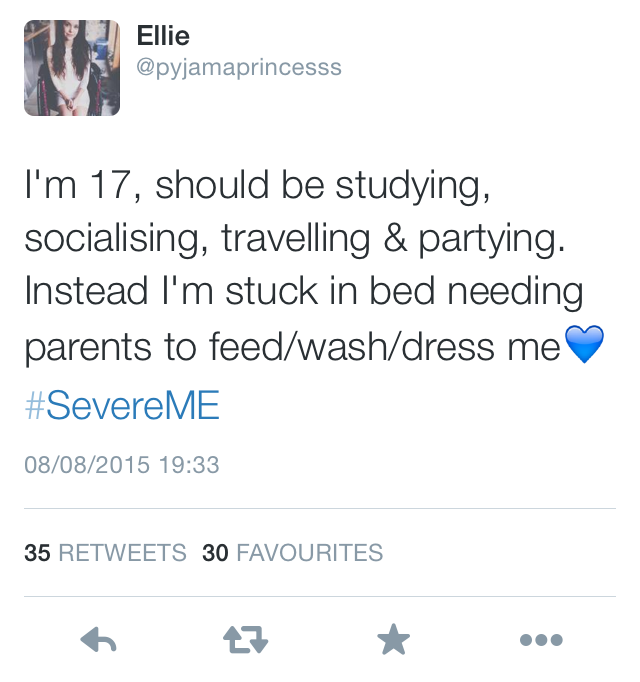 I’m going to end with a selection of tweets that I saw yesterday on the Severe ME hashtag. rhosynmd • This entry was posted in chronic fatigue syndrome, chronic illness, invisible illness, myalgic encephalomyelitis, systemic exertion intolerance disease and tagged Chronic Fatigue Syndrome, chronic illness, chronic pain, invisible illness, myalgic encephalomyelitis, Severe M.E. Awareness Day, Systemic Exertion Intolerance disease. Bookmark the permalink. Thank you for sharing about Severe ME Awareness Day. My heart is breaking, thinking of you and current sufferers and remembering when my daughter was where you are now. Sending out prayers for everyone to improve out of the severe stage and for research to develop effective treatments. Thank you for reading! And for sharing 🙂 hopefully one day soon effective treatment will be an option. A reminder that I need to sort out things so that I can offer massage in people’s homes when they have severe M.E. The two M.E. clients I see regularly have to cancel if it is a bad day and I don’t charge a cancellation fee like I do for most clients who cancel at the last minute. I also recognise that some with severe M.E. are unable to tolerate massage most of the time. I think that’s a great idea. I constantly worry about cancelation fees, because I often have to cancel at the last minute, so I think it’s so great that you do that. Sometimes I find massage too much, it sometimes aggravates the pain. And your welcome, thanks for commenting.